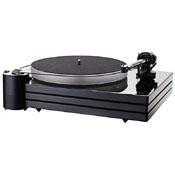 OK, I purchased my MMF 9.1 in 2014 with the Goldring Eroica LX low output moving coil cartridge. The cartridge is a line contact variety. For comparison I also have a VPIHW19 table and an AR ES1. The quick answer is that the MMF 9.1 with this cartridge produces a deeper, wider soundstage than my other table/cartridge combinations. There is more inner detail in the music reproduction and the table has been trouble free, as all my others have been. I'm uncertain what is causing the table to sound better than my other tables, it could be the cartridge, the completely isolated motor, the triple sorbothane isolated plinth or the carbon fiber tapered tone arm. I believe the Music Hall has the table made in Europe by Pro-Ject with the major differentiator being the layered plinth and cartridge selection. Caution must be used when moving the table as the motor and triple plinth all move independently.